"The Amazing 'Words of Faith' Spoken by President Trump"
You are about to be amazed to hear the President of the United States talk about Jesus Christ, salvation and more. We've prayed for decades for this to happen in our nation...and now it is. 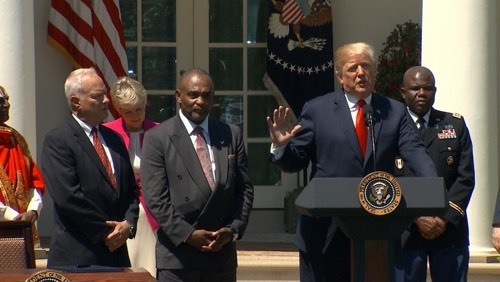 A lot has happened in the last month, and it's easy to forget the incredibly inspirational remarks given by President Donald Trump in the Rose Garden during the National Day of Prayer. Or maybe you never did have a chance to watch the video of him highlighting the role faith plays in the lives of Americans, or how he spoke about Jesus making the difference in a former bank robber's life. "Faith is more powerful than government, and nothing is more powerful than God," President Trump said, then launched into the story of Jon Ponder, who is now the CEO and founder of Hope for Prisoners, Inc.
"Jon ... ended up in federal prison, relegated to solitary confinement. That's where God found him," continued the President. "Jon began to read the Bible and listen to Christian radio. One morning at 2am he woke up to the voice of the great Billy Graham ... 'Jesus wants to be Lord of your life.' That night Jon dedicated his life to Christ..."
Trump continued, "Your story reminds us that prayer changes hearts and transforms lives. It uplifts the soul, inspires action and unites us all as one nation under God." Click here, or on the photo above, to watch the video of President Trump's moving speech beginning at this point.